Rolling up with my real estate investor friends in @gta_exotics_official sports cars: Lamborghini, Audi R8, and Maclaren. Super fun, highly recommend and thank you to everyone at GTA Exotics for making sure we had a great time. The experience was amazing, the handling, braking and acceleration is unreal. The experience was made better by sharing it with my fellow real estate entrepreneurs and my new Marketing person, Darren Cabral. He knows cars like I know houses. Darren would buy one of these if he was in my financial situation, which I think is interesting. Whenever Cherry and I have capital available, it gets invested. I do drive a decent German sedan, but that’s the norm for my line of work. To me, I would much rather vacation with the kids and acquire a vacation property. One idea is to buy one of those Pier 8 condos in Hamilton, as it will be quiet with no major roads nearby and we will be on the water yet close to a mid sized city with all the hottest cafes and restaurants. It’s just one idea, but I’m sharing because I do want you all to think bigger. I’ve had some great ideas that were born while networking and masterminding with many great investors, many well ahead of me in their careers. If you have any trouble finding folks who will raise you up, a good place to start is my own HaltonREI.ca meetings. We have the wonderful Jay Gabrani as our guest speaker on November 24th at the prestigious Sheridan College in Oakville. His lessons on preparedness from the sudden loss of his wife and mother of his three young children and the investments he made to support his life as a stay at home, single dad. Investing saved his life, including investing in stock options and private lending, so you don’t want to miss this keynote talk. Also on November 24th, my dear friend and multi-millionaire real estate investor friend, Tahani, is hosting her first ever FIRE conference, “Females In Real Estate”, at the Bisha Hotel. You will learn from Tahani and other incredible speaker on how to grow your wealth and make more money. The real estate investing industry has exploded with coaches. I get it, my team and I coach investors too. It is highly rewarding work to teach others to become successful investors, we have many multi millionaire clients who started with nothing. They are crazy grateful, doing amazing things with their families, favourite charities, and living life to the fullest. But who is a good coach? Personally, I always want to work with the best of the best, so when I first sought out a coach I asked several winners who the best coach was. That is how I found my coach since 2011, Mary-Anne Gillespie. At the time, she was head trainer for a very large brokerage. 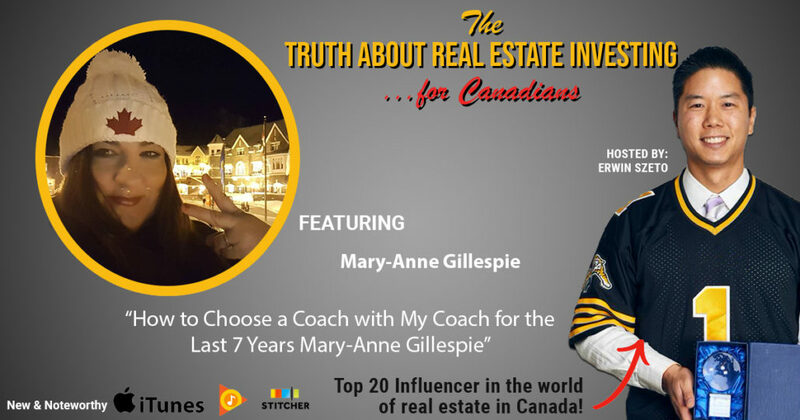 She is also a coach to many top level real estate entrepreneurs who are household names in my industry. I have no idea what she saw in me when she took me on, but here we are. Maybe because we’re both a little nuts as Mary-Anne finds marathons boring and is now preparing for an Ironman triathlon. She is also an exclusive member of the Forbes Coaching Network. To summarize, she’s a winner, coaches winners, and one can never spend enough time among winners.